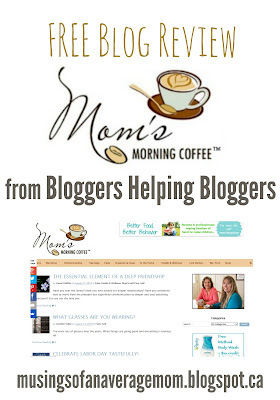 This weeks FREE blog review from Bloggers Helping Bloggers is Mom's Morning Coffee. It is nice and clean, except the logo is blurry. It was probably stretched a little larger than the original size. I love the header! I'm even impressed at the ad placement. It's unobtrusive and still on-topic. The SumoMe floating social media icons overlap with the navigation bar, though. Can they be smaller? I like the simple and clean lines of the header. There is a large ad in the upper right corner that I find a bit bothersome. It seems like the ad is more important than the blog header itself. I liked the logo. However, in mobile there is no divider to set it off and I thought that caused it to look a little lonely up there. In Desktop I noticed that there was a divider/menu bar...I would suggest a new color for the menu bar because it didn't quite match the color scheme and it also was not an appealing color either. I love the picture, font and color in the header. However, I think the ad is distracting and might be better placed elsewhere. The header is great so I would put it front and center. The pictures look large and uncluttered. I didn't see how to follow them on social media sites though. There was a small broadcast icon as part of their menu in the upper right and you can get updates via e-mail but to me it seems buried. 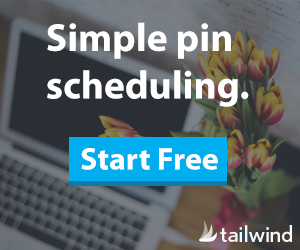 I don't like pop-up follow ads. clean and easy to read. I like that the popular posts are large images. However, your pop-up does cover the sidebar. I found the sidebar easy to navigate in mobile and desktop. I like the popular posts feature with the unified theme. I really like that your picture/about me is right at the top of the header. You might want to add a little blurb like "click here to learn more about me" (or worded how you like) because it's not immediately obvious that you can click the picture to get to the "about" page. I also like seeing your popular posts. Love the branded photos linking to popular posts. 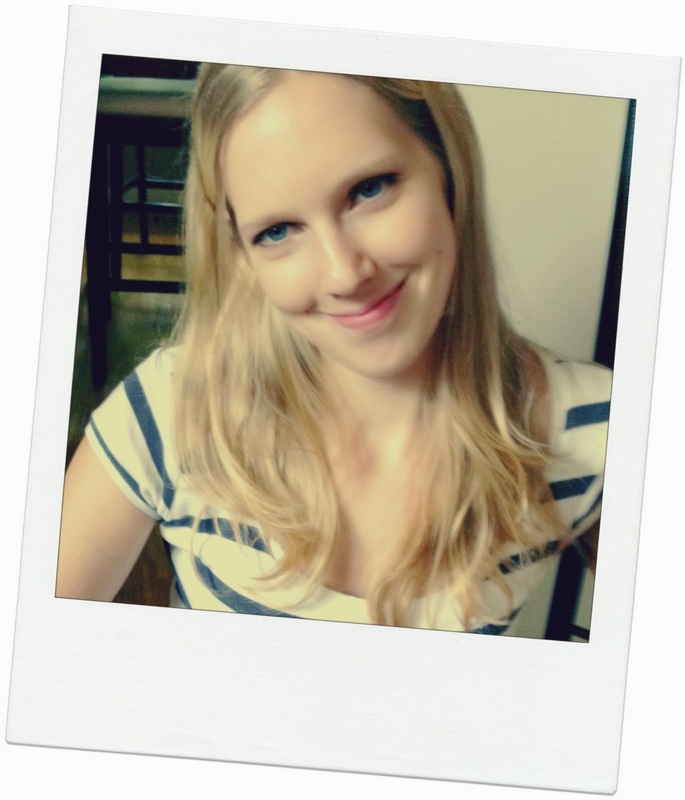 Can you add a short bio or blog description under the photo? 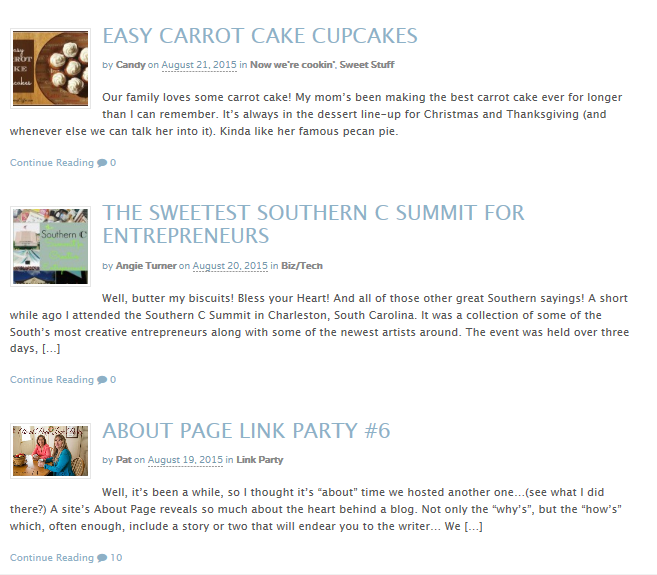 I like to know who a blogger is or what a blog is about on the home page, without needing to go to the about page. Easy once I found the bar to the left. I instinctively usually look for those are the top of the page or in the right sidebar. This is probably my biggest suggestion for this site. They have a very large floating social share bar that obscures the left side of the screen in both mobile and desktop. They also picked a rather large one at that, so the colors of it are very jarring compared to the subdued color scheme of the site. I also could not find their social share icons anywhere. People usually aren't willing to spend that much time searching for how to follow. I could not find any icon to follow you. I did see the share icons but if I want to just follow you on FB (but not share the article), there's no way to do so. If you do have the follow icons, I couldn't find them so you might need to put them in a more prominent place (but I really looked). The SumoMe buttons are share buttons, not follow buttons. I don't see a way to follow you on the home page. As I mentioned above, I couldn't easily find it. 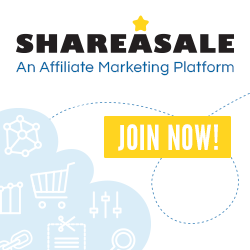 You can easily share the post on social media but not easily follow them. the content is good, though I wish there was a little more "teaser text" on the homepage for each post. I enjoyed your content. I related to many of your posts and found them easy to read. I also thought it was smart that you always added some kind of interactive statement at the end of your posts. SumoMe bar overlaps with the content, making it difficult to read. I like the Questionable Movie Night suggestion. It definitely differs from some conservative Christian perspectives that think shielding your teens from everything will somehow keep them safe in the real world. I think the idea and the guidelines would appeal to all families, religious or otherwise. I don't have kids yet, but my husband and I have discussed the potential of homeschooling depending on what schools will be available when we do have kids. I appreciate the post on electives for HS students. I've seen tons of homeschooling resources for kids, but not really the same for HS students. I know families with kids in private school or homeschool often transition to a public school because of greater options. I think homeschooling families will find your resources helpful to realize their kids can still have greater options with homeschooling. I like the contents. I generally love food posts and they have other interesting subjects too. the general fonts are easy to read, though the popular posts images are a little harder to read. Again, the floating social bar was annoying. Also, the large social share icons that appear over the images as you scroll down are not appealing. I found the fonts easy to read and love that you used the same fonts in all of your edited images. It gives you a unique and recognizable look. Fonts are large and easy to read. very simple. I would suggest adding in a search bar. I thought the navigation worked fine...maybe a little more specific than I would want, but then I guess a person can go directly to what they are interested in. The About tab almost seems hidden at the very bottom of the site. Since it explains their heart and the reasoning behind their site I think it could have a more prominent position. The tab was set up well and made your site easy to navigate. I also loved how you had a search button as well as a category list. The search box is easy to find in the upper portion of the side bar and they have lots of menus with different subject material. overall I like it. The one other suggestion I have is to shorten how much is in your right side bar (or lengthen the teaser text) on the homepage. Right now it goes way past the content of the page. I really liked the content of the site. I think the color scheme works, but could benefit from one more secondary color. The ad space at the top really takes away from the scheme in mobile mode because the green color clashes so much with the site colors (not quite as bad in desktop because it is set apart). I like the overall look of your blog. The only change I might make would be to move the ad from the very top to right under your navigation bar. Color scheme is warm and inviting. 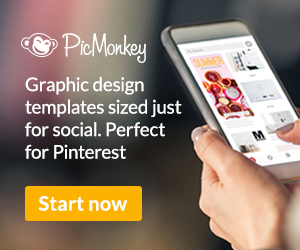 Graphics are beautiful and Pinterest-friendly. I like the overall appearance of the site. It doesn't take long to load like some other sites do. 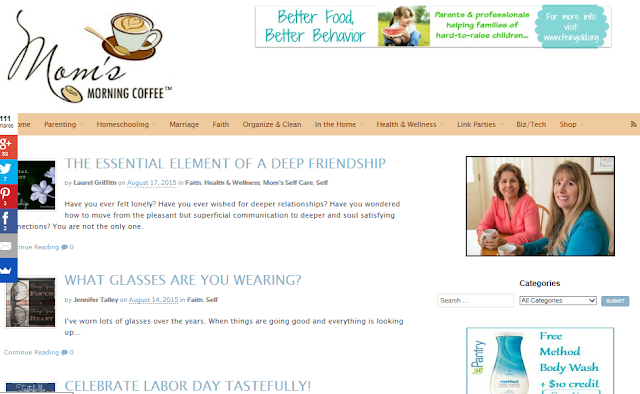 Mom's Morning Coffee looks like a nice blog with a good future. 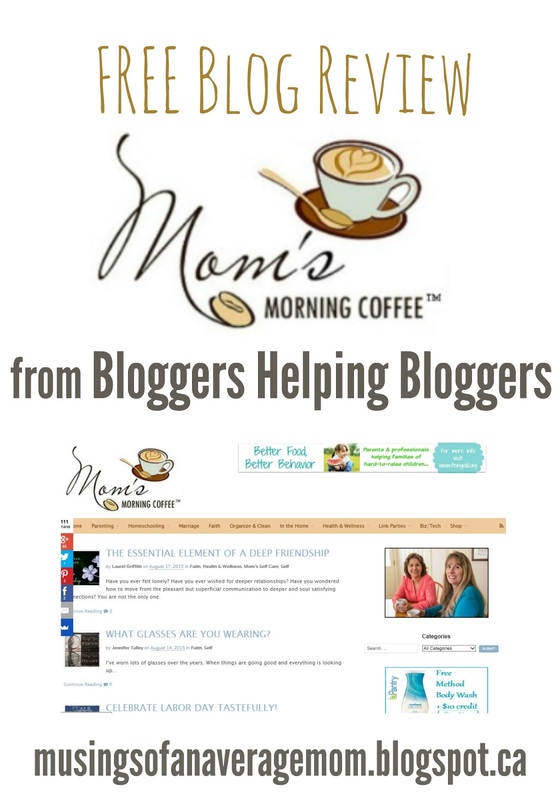 If you want your own FREE blog review don't forget to link up at Bloggers Helping Bloggers - beginning Tuesdays at 7:30 am and running until Sunday evening.